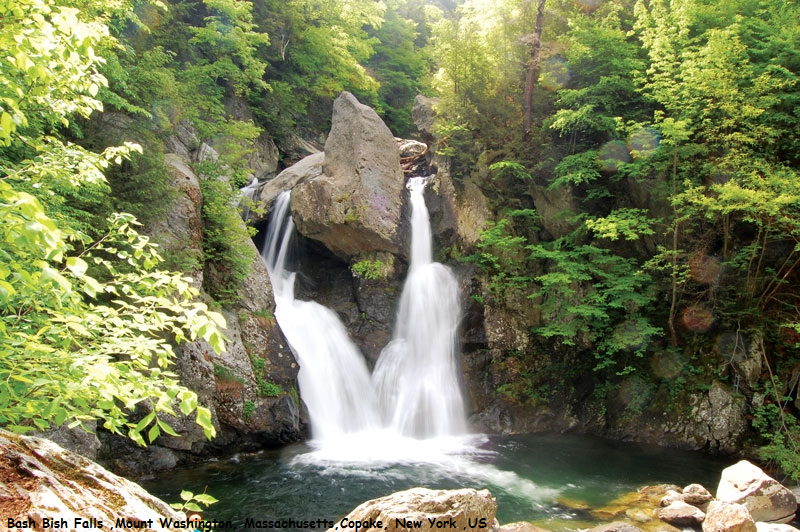 Bash Bish Falls, a waterfall in Bash Bish Falls State Park in the Taconic Mountains of southwestern Massachusetts, US (Berkshire County, Berkshire Hills, the Berkshires), is the highest waterfall in the state. The falls are made up of a series of cascades, nearly 200 feet (61 m) in total, with the final cascade being split into twin falls by a jutting rock, dropping in an 80-foot (24 m) "V" over boulders to a serene pool below. There are a few access points to the falls and more than one parking lot. You can choose to start from the New York side and cross the state line into Massachusetts or start at either of the two Massachusetts trailheads. Starting at the lower parking area off of Falls Road, this short hike follows a rugged trail along Bash Bish brook through mature forest and over boulders, tree roots, natural stone stairs, and long wooden steps.